"There's a danger that prices may crater. But deflation's the risk that is greater." They prevent the economy's boomin'." And stimulate now, while you can!" 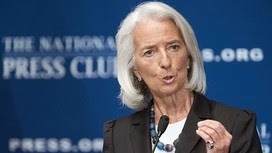 International Monetary Fund Managing Director Christine Lagarde gave a widely reported speech at the National Press Club in Washington DC, in which she sounded the alarm bells of deflation. In doing so, she moved from la Vieille Garde - the Old Guard which is obsessed with nonexistent inflation - to la Avant-Garde that recognizes from the data the degree to which advanced economies are flirting with a downward price spiral. "With inflation running below many central banks' targets, we see rising risks of deflation, which could prove disastrous for the recovery," said Ms. Lagarde. Central banks such as the Fed and the Bank of England like to see inflation at around 2%, a level at which prices rise quickly enough to nudge consumers to buy now rather than later, but not so quickly as to incite panic. At the moment, the US Consumer Price Index is up only 1.2% year-on-year, and the eurozone is barely simmering along at 0.8%. "What's wrong with that?" you may ask. The danger is that prices go into a hard-to-reverse downtrend. This would cause consumers to put off spending (since it would be cheaper in the future), thus lowering demand and aggregate economic activity. Employment would fall, and wages would chase prices into the downward spiral. As the IMF's Lagarde summed it up: "If inflation is the genie, then deflation is the ogre that must be fought decisively."